The next steps of the royal coronation procession headed from Celetná street towards the most significant Prague square, the Old Town Square, which has always been the centre of the Old Town. Also one of the most important Prague market places used to be here a long time before the square was created here in the 13th century. The sellers had exact rules concerning what and where would be marketed. 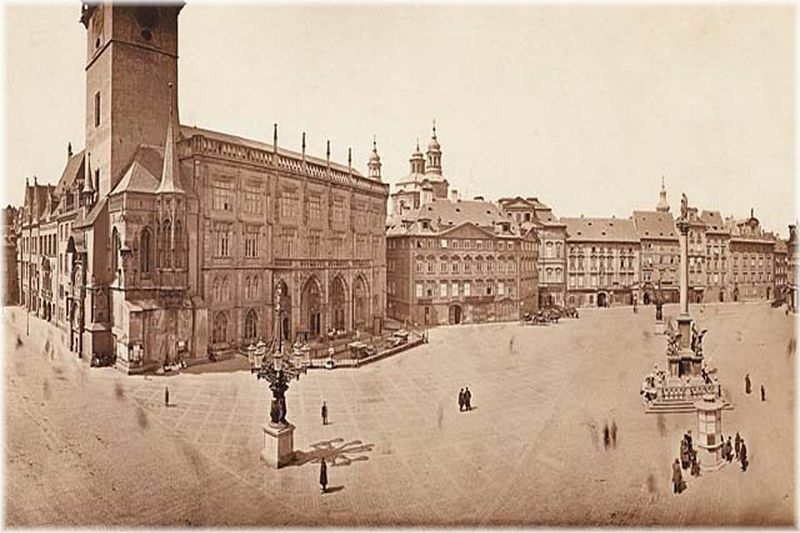 For instance, fruits were sold in the Little Square, fish at Dlouhá street and the bakers and furriers resided in place of the present Old Town Hall. Other goods were available in the nearby Ungelt. So you could virtually find all goods in the centre of the Old Town. This square has become the scene of remarkable historical events. 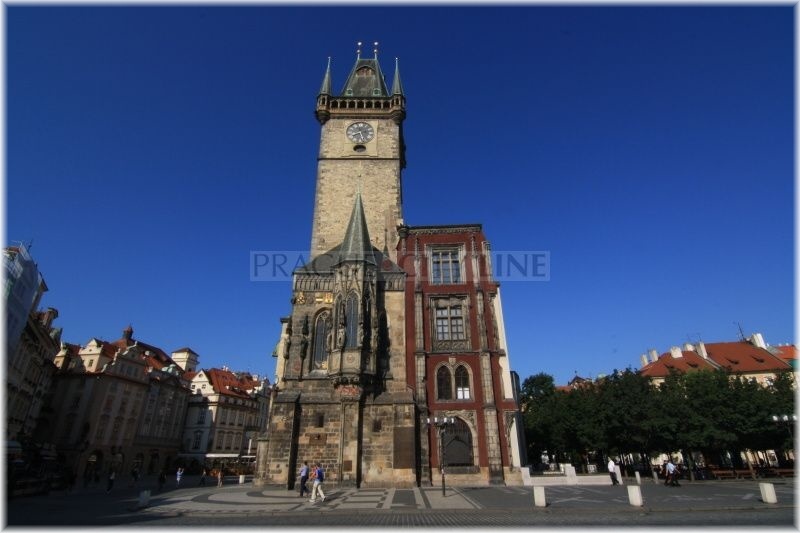 The best known happened on June 21st, 1621 when twenty-seven Czech lords were executed in front of the Old Town Hall. They were the leaders of the Bohemian Revolt against the Emperor Ferdinand II. So today you will notice the twenty-seven white crosses in the paving in front of the Town Hall which commemorating the event. The Old Town Hall is clearly one of the most remarkable monuments of the Old Town Square. It was built based on the privilege from John of Luxembourg in 1338. The construction of the town hall was formed by the several neighbouring houses. The oldest of them was the corner house with a prismatic tower. The tower was elevated later and a gorgeous Gothic chapel was built inside of it. In 1360 another house was annexed in the west side. There the extensive town hall chamber was built. A beuatiful Gothic ceiling has survived from that period. In 1458 another, already the third, house became integrated into the Town Hall. Also the period between 1805 – 1807 when the new gallery of the tower and clock were annexed. was very significant for the Town Hall. Between 1838 – 1848 a splendid Neo-Gothic wing in the east side of the Town Hall was annexed under direction of remarkable Vienesse architects. The building faced bad luck during WW2. It namely became the site of the antifascist resistance. There were immense fights here in 1945 during which the whole square was considerably damaged. As a result of the fights there was a great fire during which the Neo-Gothic wing burnt down completely and also the tower and the atronomical clock were damaged. At present, the Old Town Tower is a popular tourist attraction and setting for weddings. The tourists admire the splendid and exceptional Old Town astronomical clock (Orloj)here which was constructed in 1410. 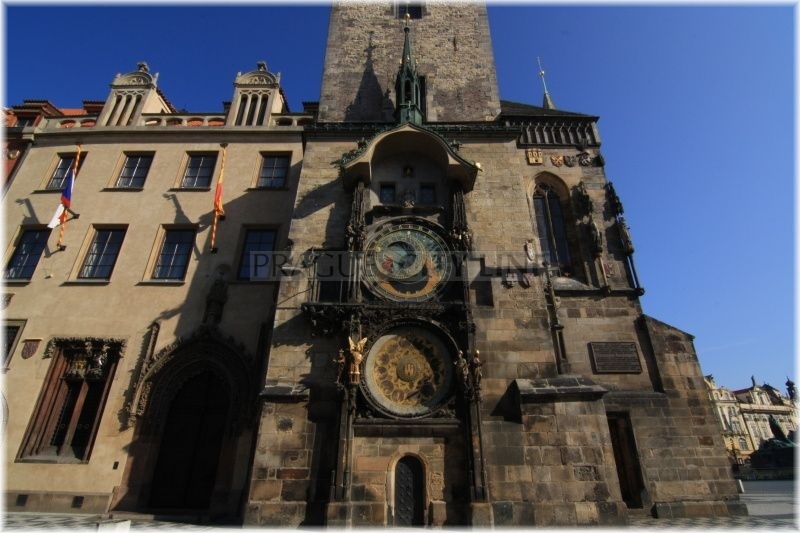 It is the most well-preserved medieval astronomical clock which has been listed among the cultural landmarks of UNESCO in the Czech Republic. 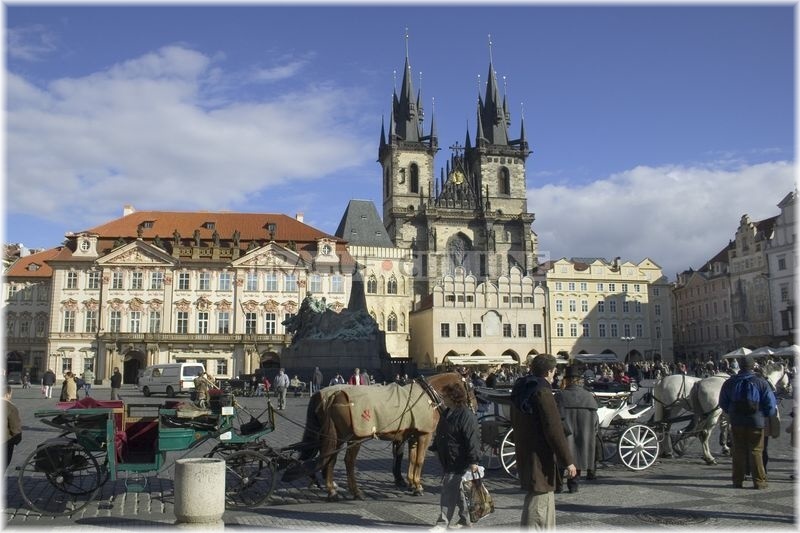 If we walk around the square we will spot a very significant Baroque landmark close to the Town Hall. It is the church of St. Nicholas, built between 1732–1737 by the architect Kilián Ignác Dientzenhofer. There used to be the original Romanic church in this place. Unfortunatelly it burnt down and therefore the church of St. Nicholas was built in its place. It was also used as a storehouse in the past, however it serves the purpose of the Czechoslovak Hussite Church currently. Every visitor is taken away by the beautiful marble altar, organ and gorgeous wall paintings. On the opposite side of the square we will see another of the many important buildings. It is palác Golz-Kinských (Golz-Kinsky Palace) located not far from the house U Kamenného zvonu (At the Stone Bell). This unique Rococo building was built in place of the two medieval houses. The palace was built between 1755 – 1765 for Count Jan Arnošt Golz. You can spot the antique statues up on the facade. In 1768 after the death of Count Golz the palace was bought by Rudolf Kinský due to whom the interior was reconstructed in Classicist style. The house became very important at the end of the 19th century when there was a German grammar school attended also by the writer Franz Kafka. 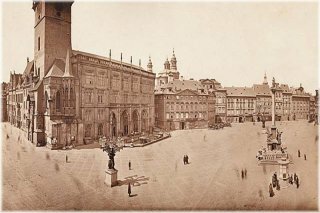 In 1949 the palace became the place of the graphic art collection of the Prague´s National Gallery. Today you will find the collection of the National Gallery called Landscape in Czech Art of the 19th century behind its walls. Another very significant monument creating a beautiful cityscape is familiarly called Týnský chrám (Týn Church). 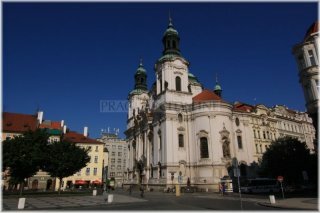 It is one of the most important Prague´s churches. 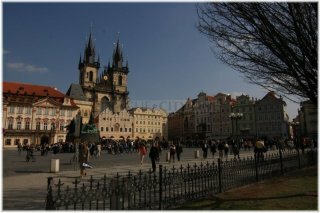 There used to stand a Romanic chapel originally and on its foundations Týnský chrám (Týn Church) was built in the 13th century. The church is related to the name of Konrád Waldhauser who used to preach there and became famous as a critic of the church offences. This beautiful three-aisled Gothic basilica is familiar especially for its typical, eighty meters high towers with a Baroque relief of Madonna with Infant Jesus placed in the gable between them. So if you long to see the whole Old Town Square and the neighbouring monuments you have the unique opportunity to step up the gallery of the church towers. 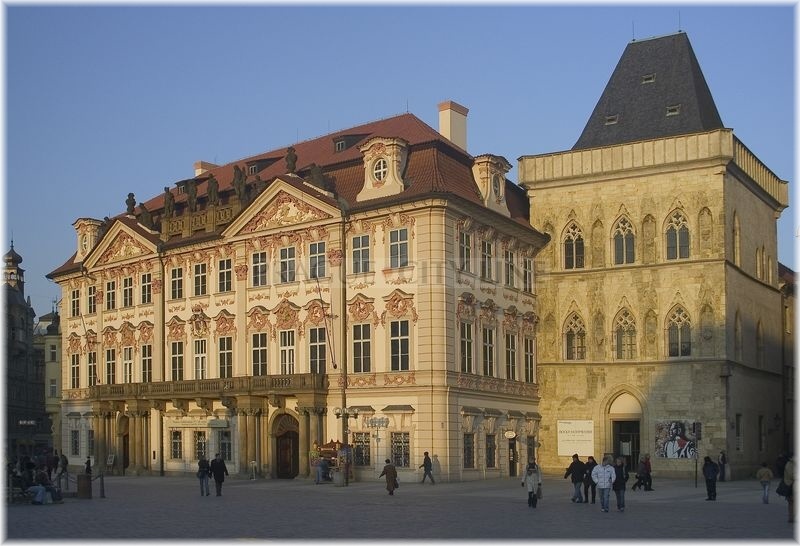 There are really many remarkable houses and other buildings in the Old Town Square. In front of Týn Church you will besides Trčkovský dům (Trček House) also see the building of Týn School which is neighbouring on the house U Kamenného zvonu (At the Stone Bell). The block of houses is closed by the houses Zlatý kříž (Golden Cross) and U Zlatého slona (At the Golden Elephant). These house are neighbouring on the Pauline monastery by the church of St. Saviour. There is a building of Pražská městská pojišťovna (Prague Municipal Insurance Company) next to it and also Schierův dům (Schier´s House). Just across the square you can take a look at Štorchův dům (Štorch´s House), house U Kamenného stolu (At the Stone Table) and the corner house U Zlatého jednorožce (At the Golden Unicorn). There is the Jan Hus memorial standing in the middle of the square. These are the historically significant houses across the Old Town Hall: U vola (At the Ox), Vilímkovský dům (Vilímek´s House), U Zlatého anděla (At the Golden Angel) and the opposite house U Bílého lva (At the White Lion). This building will attract you mainly because of its sgraffito facade with the biblical and antique scenes. The important stop during the coronation way was the Old Town Square where the procession stopped twice. The first stop was at the church of the Virgin Mary in front of Týn. Students and professors of the Charles University were standing there to take a ceremonious oath of loyalty to the new sovereign. 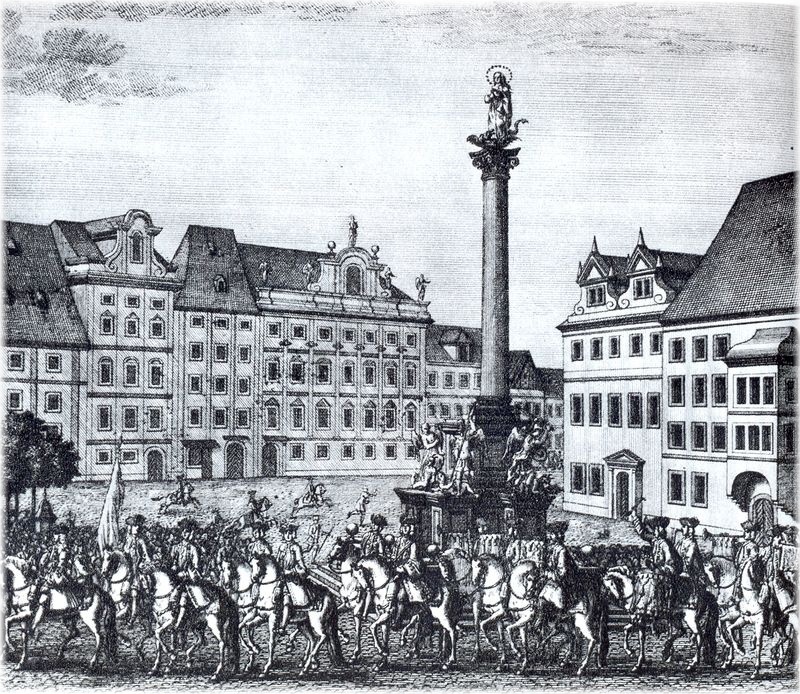 After the university made the loyalty oath, the procession continued towards the Old Town Hall where the representatives of the town patrol and the most respected representatives of the Prague towns were standing The way of formation was strictly determined. There were representatives of the most remarkable tradesmen, guilds, houseowners. All significant social classes had to be represented. Then the procession moved along Karlova street towards the Charles Bridge.